Generally choose steaks that are bright cherry red in color. However, aged steaks will have a more purplish color. The marbling (fat distribution) of the steak should be evenly distributed throughout the meat. As a general rule, the more marbling, the more flavor. Steak with little or no marbling will be more lean and tender, but has less flavor than steak with higher fat content. The most important part of creating an excellent steak dish is using the correct cut. There’s a wide selection of different cuts of steak perfect for various flavors and recipes. Rib: The rib is an extremely flavorful part of the meat. It contains cuts with the bone included (Rib Roast, Back Ribs) and boneless cuts (Rib-Eye). Rib-Eye is often known as the ‘Butcher’s Favorite’ because it is extremely rich and tender. It is highly marbled and fine-grained. The best cooking methods are broiling, grilling and sautéing: just be careful of the flare-up from the fat while cooking. Loin: This refers to the section that is in-between the ribs and the round (the hind) of the animal. Short loin, the first half of the loin, provides the prime cut of Strip Loin Steak. It’s lean, tender and fine-grained, and is usually sold with a half-inch of fat on one side. We recommend trimming off the fat only after it has been cooked, to give the meat more flavor. This steak is also known as a Kansas City Steak, Manhattan Steak and New York Strip. In the hind-half of the loin, you find premium cuts such as Porterhouse, Tenderloin, Top Loin and T-Bone. Tenderloin is anincredibly tender cut, because it lies right under the backbone, and therefore is not exercised. Also known as Filet Mignon, Fillet and Chateaubriand, we recommend grilling or pan-searing this cut. The backbone area of the loin is where Porterhouse and T-Bone are found: both cuts include a T-shape bone with Tenderloin on one side, Strip Loin Steak on the other. T-Bone steaks are cut closer to the front (the rib), and thus contain more Strip Loin Steak and less Tenderloin. The Porterhouse, in reverse, is cut closer to the rear of the animal, containing a larger section of Tenderloin. When cooking these cuts, be mindful the Tenderloin will cook faster than the strip-side. We recommend grilling or broiling rather than pan-frying. The Sirloin area of the loin lies near the backbone and can be divided into three sections: Sirloin, Top Sirloin and Bottom Sirloin. Sirloin, in general terms, refers to the entire area, and can mean any of ten inferior quality cuts. These include Ball-Tip and Tri-Tip Steaks (bottom sirloin), Baseball Cut Steak (top sirloin) and the most tender, Pin Bone and Flat Bone Steaks. Be careful not to confuse Sirloin with Strip Loin Steak, which is far superior in quality, and found in the front-section of the short loin. Generally, sirloin is lean and has the right amount of marbling for moderately tender texture. It’s best cooked by grilling or pan-frying, and the tenderness can be enhanced by marinating the steak. Round: This refers to the hind-area, close to the back-legs. These cuts tend to be less expensive, lean and flavorful, but moderately tough. They are often used to make ground beef. A lack of fat and marbling makes round dry out when cooked with dry-heat methods like roasting or grilling. Instead, we recommend braising to seal in the moisture, and then serving in thin slices. These steaks are sometimes referred to as Top Round Steak, Bottom Round Steak, Rump Steak, Eye of Round Roast or Steak, Butterfly Top Round Steak and London Broil. Marinating is particularly effective with Chuck Steak, Round Steak and Sirloin Steak. Try heating a tablespoon of olive oil in a small skillet, and then add one “Knorr® Homestyle Stock Beef” over very gentle heat, stirring for 3-4 minutes. Allow the mixture to cool for 5-10 minutes and then add lemon juice, herbs and chilies to taste. Rub the mixture firmly into the meat using your fingers. Leave to marinate for 1 hour before cooking. For more tender cuts such as Strip Loin, and Tenderloin steak, a simple seasoning is more suitable than marinating. You can use a crushed Knorr Bouillon Beef Bouillon cube and olive oil to create a rub that can be applied to the steak before cooking. 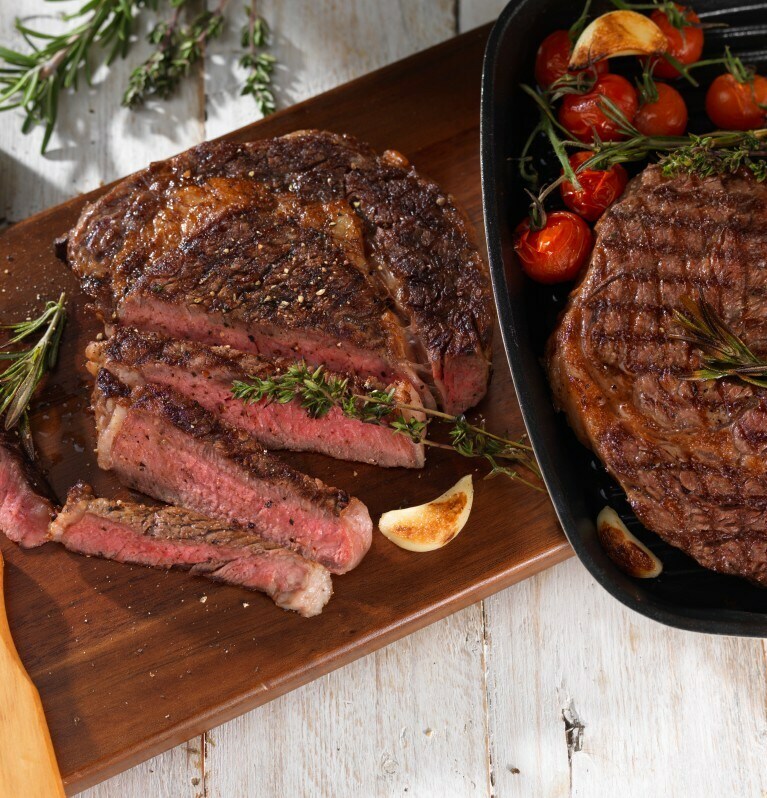 Once your steaks are unwrapped, it’s ideal to bring them to room temperature 20-30 minutes before cooking. This ensures that the steak doesn’t cool down the oil when it’s placed in the skillet, and browns perfectly. Use a paper towel to pat the steak dry on both sides before cooking. Use a stainless steel pan. If your pan is small, do not grill/fry more than one steak at a time. If you add more than two steaks to the skillet, the temperature will drop and the steaks will stew, rather than fry. Set your skillet to high heat. To ensure it’s hot enough, sprinkle water on the skillet and ensure that it beads. After the water has evaporated, add a little oil to the skillet and make sure it’s lubricated the bottom of the pan before you add the steak. Add your steak to the center of the skillet. Do not drop the heat while the steak is cooking. Once the bottom side of the steak is nicely browned, flip it to brown the other side. Before serving, let the steaks rest for a few minutes on a tray or plate. This allows the juices to be re-absorbed into the meat.